South Africa celebrates National Braai Day on 24 September every year. A day for all the citizens of South Africa to unite around braai fires with family and friends. The driving force behind this initiative is the man known as Jan Braai. 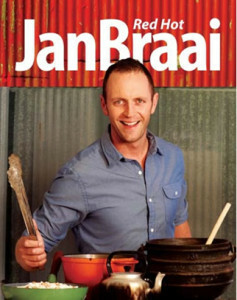 In this second book, Red Hot, Jan Braai moves beyond instructions for braaing steak, chops and wors, he challenges us to try curry potjies, soups, pancakes, chicken mayo braaibroodjies and even Mlava pudding and apple tart, all cooked on a fire! The recipes are new but the book has the same fantastic photos, clear and easy-to-follow recipes and Jan’s characteristic touches of braai humour.